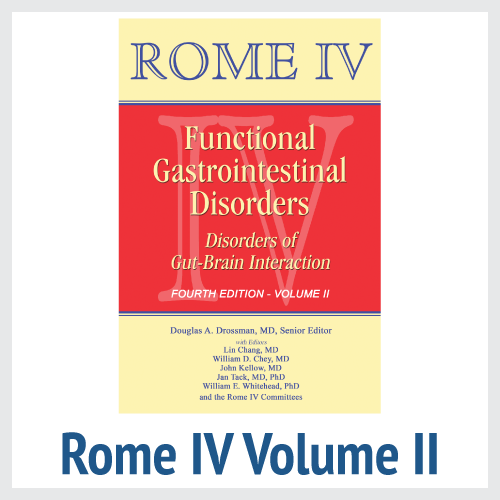 View cart “Rome IV Functional Gastrointestinal Disorders for Primary Care and Non-GI Clinicians (First Edition)” has been added to your cart. The diagnostic criteria, designed primarily for research, has a limited role in clinical practice. Patients don’t go to doctors complaining of IBS, or sphincter of Oddi dysfunction; they present with symptoms of abdominal pain, nausea, vomiting and constipation, among others. Accordingly, the Foundation initiated a multiyear committee process to address this concern by incorporating diagnostic decision making, information about testing and the use of the symptom-based criteria into a series of clinical algorithms. 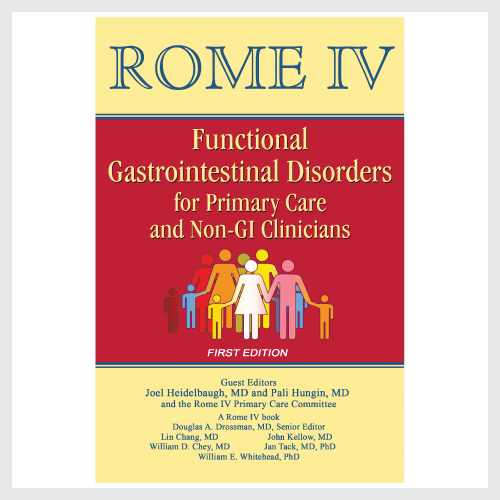 For the 1st edition published in 2010 as a special issue of the American Journal of Gastroenterology, 15 common gastrointestinal symptom presentations were created, and from that entry point, the committees developed evidence-based and cost-effective diagnostic pathways that followed each of these clinical presentations. 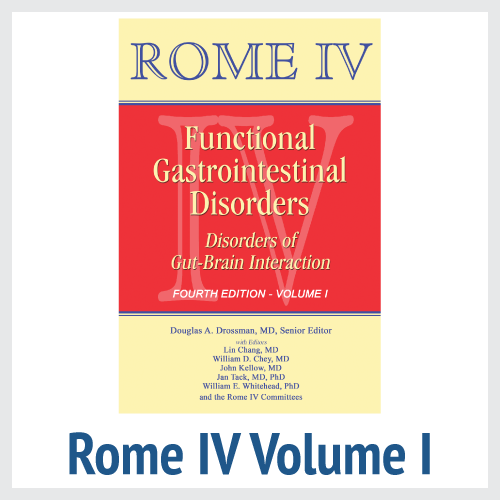 This 2nd edition, with guest editor John Kellow, MD, was developed concurrent with that of the Rome IV book. 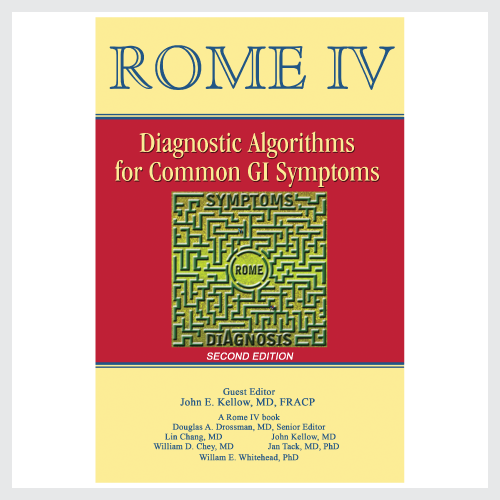 Thus we called upon the Rome IV chapter committee members to accomplish this update and revision with the creation of new algorithms, all consistent with Rome IV diagnostic guidelines and criteria. Now there are 19 algorithms for adults, and 10 for neonates, toddlers, children and adolescents. The book is organized into 8 separate chapters that cover the symptom presentations of the primary GI regions in adults (esophagus, gastroduodenal, biliary, bowel, anorectal and centrally mediated abdominal pain) as well as the symptom presentations in neonates-toddlers and children-adolescents. Each chapter has an introductory discussion section to help the reader understand the nature and underlying pathophysiology of the symptoms relative to that region or age group and then move on to discuss for each chapter anywhere from two to fourteen algorithms. Then for each algorithm we include features that bring the information to clinical reality: a) a case report linked to the algorithm in order to demonstrate real-life application, b) a color-coded algorithm graphic using standard “yes-no” decision tree methodology for branched decision making, c) links for each box to information that explains in detail the reasons for the clinical decision or the diagnostic assessment method and d) up-to-date references to support the clinical information. Thus, each common GI symptom yields a clinically meaningful diagnostic algorithm image and incorporates diagnostic testing recommendations, ending with specific diagnoses. 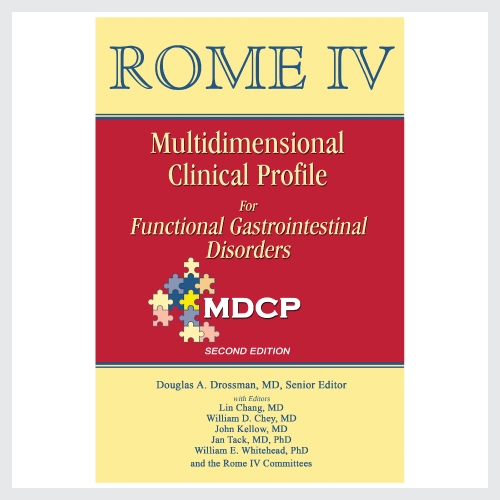 When other structural disorders are excluded, the path leads to the Rome diagnostic criteria and ultimately the diagnosis of the FGID. 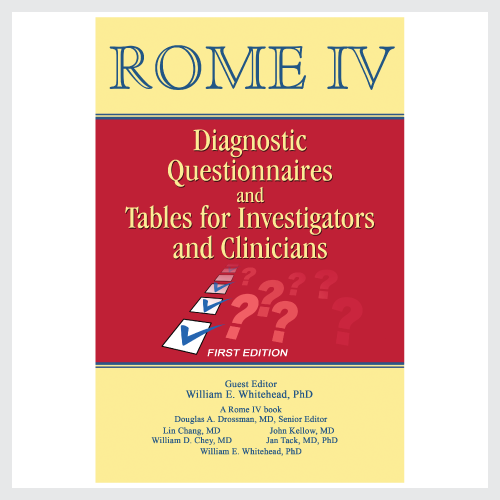 Finally, there is an appendix that includes the Rome IV Diagnostic Criteria for reference and also the Rome IV Psychosocial Alarm Questionnaire to help providers decide when in the evaluation is referral to a mental health consultant recommended.